The Birdwood Park Memorial Grove commemorates those who served in World War One. The grove was officially named "Birdwood Grove" on the 14th July 1917. Towards the end of the First World War, the Reserve became a Memorial Park to honour the Shire residents who had served in that conflict. 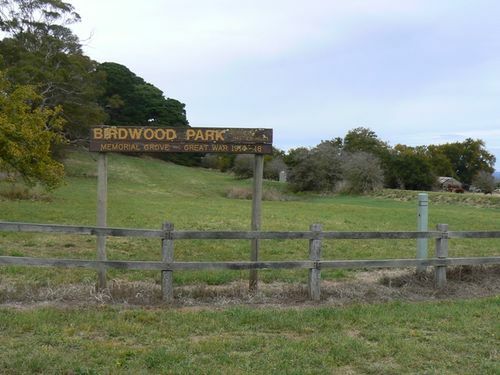 Accordingly it was renamed "Birdwood Park" after the Commanding Officer of the ANZAC Forces. There is a commemorative planting of a small Memorial Avenue of oaks and poplars near the north boundary and scattered Monterey pines mainly on the hill section. In between the Wars, school children would visit the Park on Empire Day and place floral tributes beside the trees.